The American Heart Association, Centers for Disease Control, and the American College of Cardiology (among others) categorically agree that "progress, not perfection" should be our goal. Time and time again the pursuit of perfection leads to failure. Inability to keep a predetermined schedule leads to the all – or – nothing decision to "quit your diet." Patients and the public should strive to accumulate as much change as possible in the long run. That is, successful weight loss will come for the person that is persistent about accumulating 15 workouts or 15 healthy meals or 15 recoveries in total, rather than necessarily in a specified amount of time (ie, 10 pounds in 10 days). Rigid structure leads to failure. People cannot follow generalized day by day schedules for a host of reasons: the body rebels, life gets in the way, motivation wanes, etc. Weight Watchers is endorsed by many medical groups, and has been successful largely because of the implantation of flexibility to obtain the long term goal. The Catching Point Transformation introduces a method by which users can enjoy the same control while staying on track with regard to fitness, recovery, and diet. Managing weight loss using these principles means gaining momentum and turning the corner, reaching what we've called the Catching Point. Transforming through the Catching Point is a new approach founded in science - and the process is enjoyable. 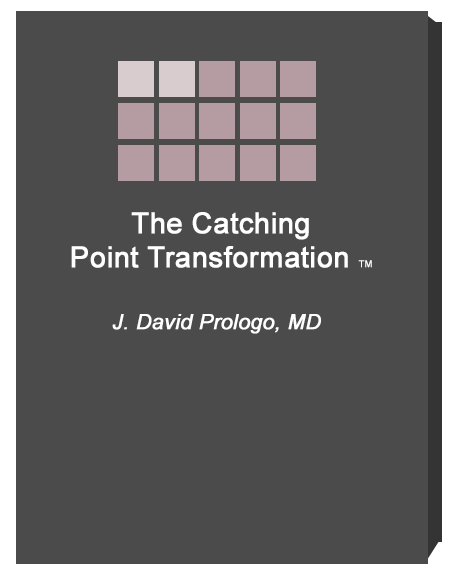 The Catching Point Transformation team is comprised of a combination of dedicated medical, scientific, exercise, and software engineering experts motivated to design a program specifically tailored to manage individual hunger hormone responses through exploitation of retrograde neuroplasticity (changing the brain's perception of diet and exercise by doing specific exercises and supplementing specific recoveries). The Catching Point Transformation program is designed for use by obesity medicine specialists as part of a comprehensive treatment approach, but will also be made available to the public in order to combat fad diet failures and improve the health of people. The Catching Point Transformation is unique because it is dynamic – it changes with your body’s feedback and absorbs your ups and downs to keep you on track. 1. Staff AN. 100 Million dieters, $20 Billion: The Weight Loss Industry by the Numbers ABC News2012. Available from: http://abcnews.go.com/. 2. Tsai AG, Wadden TA. Systematic review: an evaluation of major commercial weight loss programs in the United States. Annals of internal medicine. 2005 Jan 4;142(1):56-66. PubMed PMID: 15630109. 3. Gudzune KA, Doshi RS, Mehta AK, Chaudhry ZW, Jacobs DK, Vakil RM, et al. Efficacy of commercial weight-loss programs: an updated systematic review. Annals of internal medicine. 2015 Apr 7;162(7):501-12. PubMed PMID: 25844997. Pubmed Central PMCID: 4446719. 4. Berthoud HR. Homeostatic and non-homeostatic pathways involved in the control of food intake and energy balance. Obesity. 2006 Aug;14 Suppl 5:197S-200S. PubMed PMID: 17021366. 5. Berthoud HR. Neural control of appetite: cross-talk between homeostatic and non-homeostatic systems. Appetite. 2004 Dec;43(3):315-7. PubMed PMID: 15527935. 6. Howe SM, Hand ™, Manore MM. Exercise-trained men and women: role of exercise and diet on appetite and energy intake. Nutrients. 2014 Nov;6(11):4935-60. PubMed PMID: 25389897. Pubmed Central PMCID: 4245573. 7. Gardiner JV, Jayasena CN, Bloom SR. Gut hormones: a weight off your mind. Journal of neuroendocrinology. 2008 Jun;20(6):834-41. PubMed PMID: 18601707. 8. Kjaer M, Secher NH. Neural influence on cardiovascular and endocrine responses to static exercise in humans. Sports medicine. 1992 May;13(5):303-19. PubMed PMID: 1565926. 9. Weiss CR, Gunn AJ, Kim CY, Paxton BE, Kraitchman DL, Arepally A. Bariatric Embolization of the Gastric Arteries for the Treatment of Obesity. Journal of vascular and interventional radiology : JVIR. 2015 Mar 13. PubMed PMID: 25777177. 10. Chandarana K, Batterham RL. Shedding pounds after going under the knife: metabolic insights from cutting the gut. Nature medicine. 2012 May;18(5):668-9. PubMed PMID: 22561824. 11. Karra E, Yousseif A, Batterham RL. Mechanisms facilitating weight loss and resolution of type 2 diabetes following bariatric surgery. Trends in endocrinology and metabolism: TEM. 2010 Jun;21(6):337-44. PubMed PMID: 20133150. 12. Kaplan L, editor Obesity: A Panoptic Perspective. Overcoming Obesity; 2014; Phoenix, AZ: American Society of Bariatric Physicians. 13. Rowe GC, Safdar A, Arany Z. Running forward: new frontiers in endurance exercise biology. Circulation. 2014 Feb 18;129(7):798-810. PubMed PMID: 24550551. Pubmed Central PMCID: 3981549. 14. Fabricatore AN. Behavior therapy and cognitive-behavioral therapy of obesity: is there a difference? Journal of the American Dietetic Association. 2007 Jan;107(1):92-9. PubMed PMID: 17197276. 15. Association AH. American Heart Association Recommendations for Physical Activity in Adults 2014. Available from: http://www.heart.org/. 16. Jeffery RW, Drewnowski A, Epstein LH, Stunkard AJ, Wilson GT, Wing RR, et al. Long-term maintenance of weight loss: current status. Health psychology : official journal of the Division of Health Psychology, American Psychological Association. 2000 Jan;19(1 Suppl):5-16. PubMed PMID: 10709944. 17. Looney SM, Raynor HA. Behavioral lifestyle intervention in the treatment of obesity. Health services insights. 2013;6:15-31. PubMed PMID: 25114557. Pubmed Central PMCID: 4089816. 18. Mujika I, Padilla S, Pyne D, Busso T. Physiological changes associated with the pre-event taper in athletes. Sports medicine. 2004;34(13):891-927. PubMed PMID: 15487904. 19. Janikowska G, Kochanska-Dziurowicz A, Zebrowska A, Bijak A, Kimsa M. Adrenergic response to maximum exercise of trained road cyclists. Journal of human kinetics. 2014 Mar 27;40:103-11. PubMed PMID: 25031678. Pubmed Central PMCID: 4096097. 20. Pattyn N, Cornelissen VA, Eshghi SR, Vanhees L. The effect of exercise on the cardiovascular risk factors constituting the metabolic syndrome: a meta-analysis of controlled trials. Sports medicine. 2013 Feb;43(2):121-33. PubMed PMID: 23329606. Pubmed Central PMCID: 3693431. 21. Menicucci D, Piarulli A, Mastorci F, Sebastiani L, Laurino M, Garbella E, et al. Interactions between immune, stress-related hormonal and cardiovascular systems following strenuous physical exercise. Archives italiennes de biologie. 2013 Sep;151(3):126-36. PubMed PMID: 24599630. 22. Clinical Guidelines on the Identification, Evaluation, and Treatment of Overweight and Obesity in Adults--The Evidence Report. National Institutes of Health. Obesity research. 1998 Sep;6 Suppl 2:51S-209S. PubMed PMID: 9813653. 23. Searight R. Realistic approaches to counseling in the office setting. American family physician. 2009 Feb 15;79(4):277-84. PubMed PMID: 19235494. 24. Poston WS, 2nd, Foreyt JP. Successful management of the obese patient. American family physician. 2000 Jun 15;61(12):3615-22. PubMed PMID: 10892633. 25. Jensen MD, Ryan DH, Apovian CM, Ard JD, Comuzzie AG, Donato KA, et al. 2013 AHA/ACC/TOS guideline for the management of overweight and obesity in adults: a report of the American College of Cardiology/American Heart Association Task Force on Practice Guidelines and The Obesity Society. Journal of the American College of Cardiology. 2014 Jul 1;63(25 Pt B):2985-3023. PubMed PMID: 24239920.